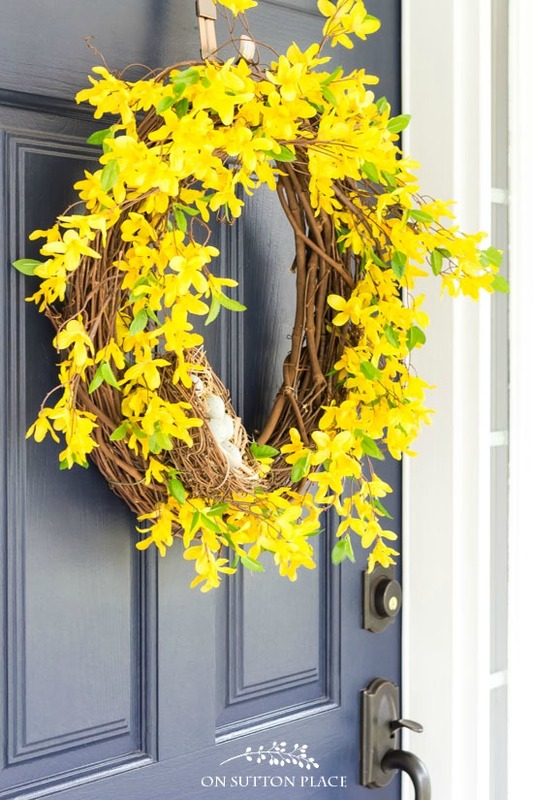 Bring a pop of yellow to your front door with this DIY Spring Forsythia Wreath. Uses basic craft store items. Easy and fast to assemble! 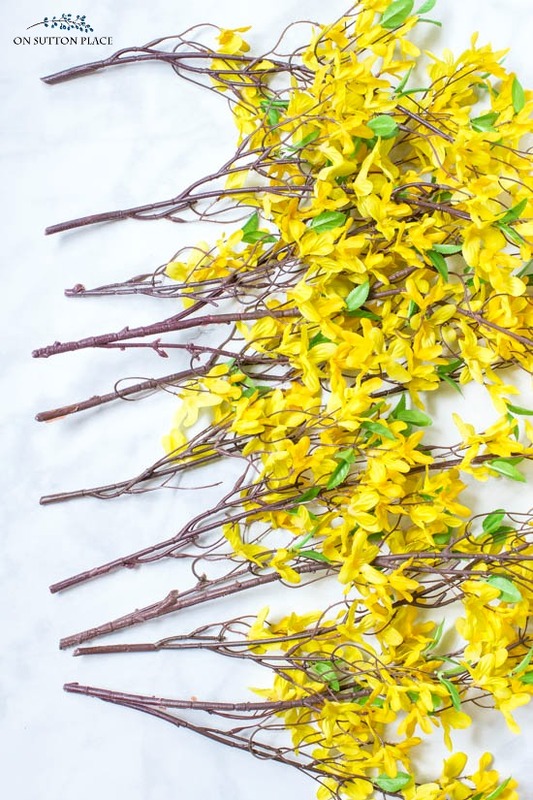 Here’s a little tip…if you want a pop of color and a quick spring pick-me-up, get yourself some forsythia! 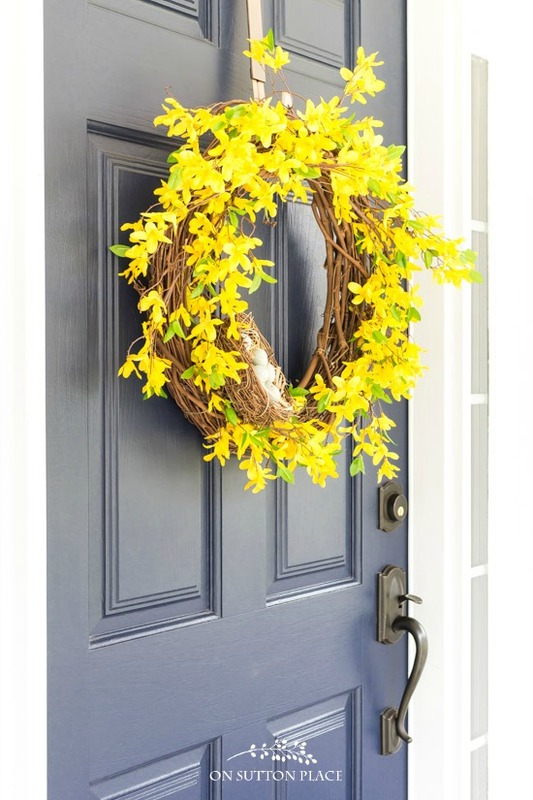 It has been gray and rainy here for days, but when I hung this spring forsythia wreath on my door, I instantly felt better. There is definitely something about the color yellow that adds sunshine to a dark day. With the wire cutters or heavy scissors, cut the individual stems from each forsythia bush. My bushes had five stems each which left me with ten stems. Working on a flat surface, attach a hanger to the wreath with a piece of florist wire. Using the hanger to mark the top of the wreath, begin inserting the stems into the grapevine. Imagine the spokes on a wheel and follow that pattern. Start at the top and insert five stems in the left side, ending at the bottom center of the wreath. Starting at the top again, insert five stems into the right side of the wreath, ending at the bottom center. Stand back and make any necessary adjustments so the blossoms look relatively even. 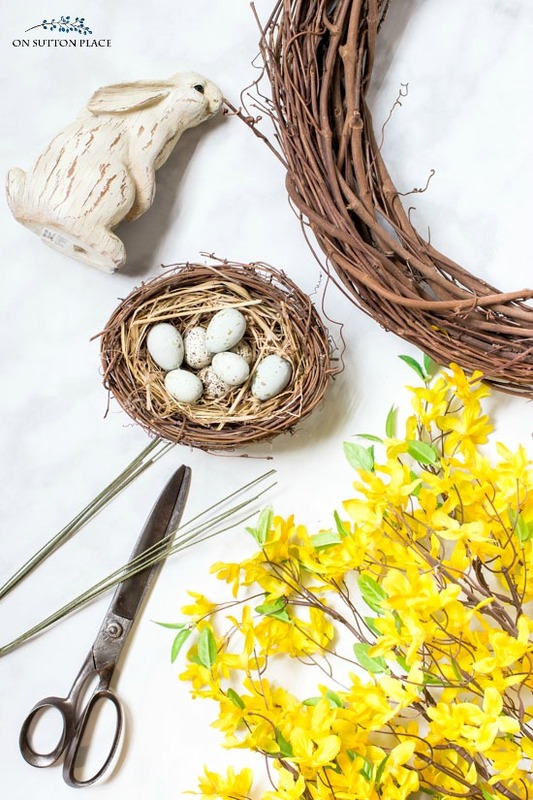 Using another piece of florist wire, attach the nest with eggs. Just stick a piece of wire through the nest and wire it on to the grapevine. 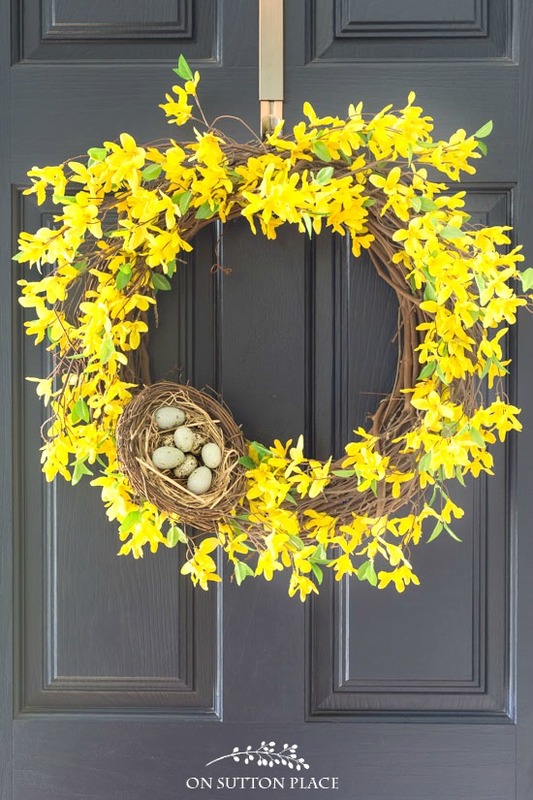 I actually didn’t spend a dime on this spring forsythia wreath. I still had the forsythia basket I made a few years ago, so I just used re-used the flowers. I had everything else. If you wanted to make this from scratch, I am sure it can be done for under $25.00. Maybe much less. I hope you have time to visit a few of the links listed below. Thanks for stopping by! 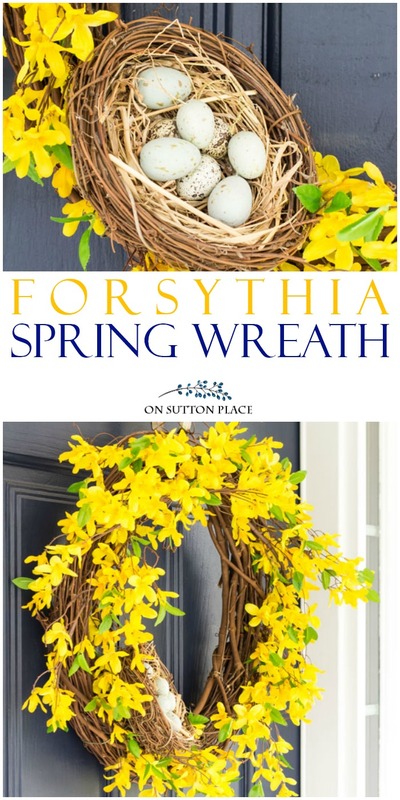 Thanks for sharing how to make a forsythia wreath. I plan make one for my front door! I really found your mixing pillow patterns interesting. I ordered a set of pillow covers with stylized navy blue flowers with a pale blue background and also have a lumbar pillow with a gray bird on a navy blue background with a few large white flowers. I was thinking I might need to brighten things up a bit with some yellow colored pillows. I do like pale yellow checked or geometric designs. What do you suggest to go with the navy flowers on a pale blue background. I love your choice of blue and yellow in your livingroom. I’m still pretty new at mixing patterns. Would really appreciate your help Ann. Hi Connie! If you want to add yellow, try to find a pattern that combines either the navy with yellow, or the light blue with yellow. Your idea of a small check would work well too. Good luck! Hi Shirley! I’m sorry for the delay in answering. The best thing to do is cut the stems to a length so they don’t stick out the back. Also, if you insert them at a slight angle, like the spokes of a wheel, they go into the wreath instead of out the back. I hope this helps! What a lovely bright spring wreath! Your wreath is so beautiful Ann! Love th pop of yellow! I think you displayed a wreath like this a couple of years back. And because I love your timeless style that just is wonderful, I found one at a local craft shop. I bought it and hung it on my front door. It was hanging for about a week and my son noticed that birds were building a nest in it. Now anyone that knows me knows that i do not like birds anywhere near me. I’ll feed them in winter, but i do not want a bird nest any where near my front door. Those crazy birds flew in my house and that was it. That wreath came down from the door and promptly went on the wall over my bar. It is funny now, but not so much then. That’s really pretty Ann. I pinned it to my Wreaths board. What a beautiful pop of color! This wreath is perfection!! This is exactly what I have been looking for to spruce up my front door. Thank you for sharing!! Thanks so much for the Irish Blessing Printables. They are the touch I was looking for to celebrate St. Patrick’s Day. I also appreciate the DIY Spring Wreath collection, another timely post. Cheers! So pretty, Ann… I always like your projects! That is a very cheerful wreath! I think it IS time for a little cheer after all the grey and frigid weather we’ve had this winter. We’ve actually had sun for two days in a row up here in Michigan and I have really appreciated the lift it gives me. Truthfully, I just today got my Christmas wreath taken down off the front of the house. Can you believe it? We don’t use our front entrance much at all and I sort of lose track of what is out there! But today when I went out to the mailbox I spied the wreath on my way back in and decided that this was the day to get that darn wreath down. Now I can work on getting something more Spring-like hung and hopefully it won’t stay up until our next holiday season! The bird nest with eggs is such a pretty touch! SO pretty and cheery…I just love forsynthia branches! And I agree, when I hung my spring wreath, I instantly felt better too! The yellow! I just love the flowers on this! Love the yellow splash ! Spring is on the way ,while out walking this morning I saw a robin . He was singing his Cheer up song and I have tulips poking their noses through in the garden . 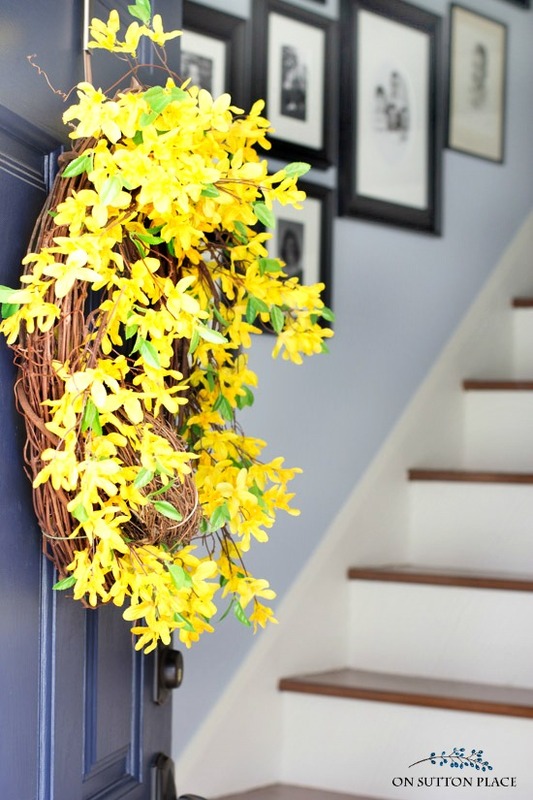 Love the wreath – I have yellow in my house & it always gives me a lift! Thanks! Nothing says spring like forsythia! I need to plant a forsythia bush. The lovely yellow is just like sunshine to me. Our winter hasn’t been bad except not enough moisture, but I am so ready for spring. Very pretty and an easy craft.Looks beautiful on your door. I love making wreaths. This one definitely looks like spring. As soon as the forsythia bush blooms in the back yard I know that spring is really on the way and it makes my heart glad. I think that this should be my next craft project. Thank you for all your wonderful yet easy to achieve projects and ideas. Ann, not pertaining to today’s blog, but yesterday I made Lemon Shortbread cookies and they were easy and delicious. Thanks so much for all you do to make our world and lives more beautiful and tasty. Yellow just says spring to me. I love it. What a nice pick me up for the front door. We certainly need it this year in our part of the country. Last week we suffered with an ice storm but now we are in the 50’s. Thanks so much for all the effort you put into this blog.